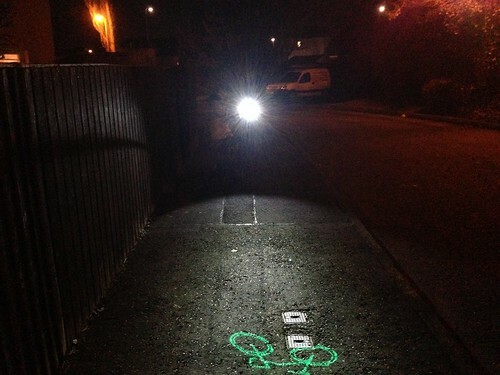 The only project I have so far put money towards at Kickstarter is the Blaze Bike Light. Funded at the end of 2012, the light finally arrived in February 2014. Yep, over a year later. It was originally supposed to arrive after 4 months, but 14 months later, and after excited emails repeatedly being sent by the creator promising it would be delivered “next month”, I gave up hope of ever seeing it. But it did finally arrive. Was it worth the wait? Is it going to be worth shelling out £125 for one? Summary: no. Why? Well… I had some problems, as follows. I brought the light home after it arrived at my work, and tested it out in the darkness by attaching it to my bike and seeing what it looked like while the bike was stationary. The clip that goes around the handlebars was squint, and needed some fairly serious bending to allow the light to be attached. Took me about 10 minutes of faffing to get the thing on the bars. To get it attached, I also had to unwrap my bar tape, as the mounting clip is not that big. It didn’t feel that secure on the bars, either. I had the screws tightened but the light was still bouncing a bit, not steady like my Cateye. The lit up green bike was as advertised, nice and bright, though. Or at least, it appeared that way when I had it out the back of my house and I was shining it on the ground. The white light, on the other hand, is extremely bright. That’s surely a good thing, you’d think? But it is so bright, in fact, that I was not convinced I was going to be able to use it, because I had it pointed down as far as I can so that the green bike is at least some distance ahead of me, but when standing facing the bike with one my my various daughters holding the bike, I was still generally blinded. And that’s on the low setting; turn it up to the high setting and I couldn’t see anything any more. Initially, I planned on having only the green bike on when I’m on cycle paths, and keeping my Cateye on. When on roads, I would turn on the white light on the Blaze. I had hoped that my initial fears would be replaced by the joy of seeing this light in action on the roads. Alas, the opposite is true. I am quite disappointed with the light, and if I’d bought it in a shop, I’d be returning it. Since it’s a Kickstarter project, I won’t be doing that, because I accepted it was a risk, but for the sake of the team who made it, I hope they make a number of significant improvements to the light. 1. The green bike is not bright enough. You might be able to see if on a dead flat surface in pitch black, potentially when it is dry, but in most cases today (both this morning and this evening) I could not see the light in front of me while moving – and if I can’t see it, there’s no chance a driver can see it. 2. 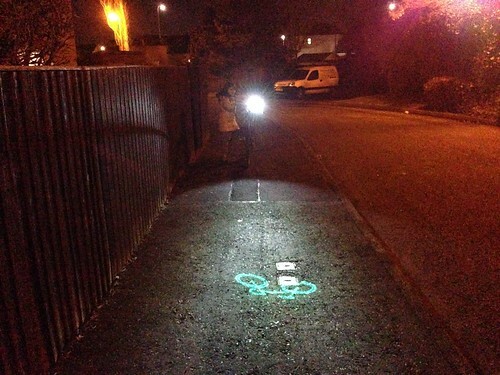 You can’t direct the green bike light independently of the white light. This is a major flaw. It basically means you can use one or the other, because to have the green light pointed in the distance means you blind oncoming people. 3. The green light is impossible to see even in pitch black because the light is not held firmly in its mount. Our roads in Edinburgh are not silky smooth, they are rough, which makes the light hard enough to see on the surface of the road as it is, but because the mount does not hold the light firmly, it bounces around like crazy, and the laser image becomes distorted so it becomes invisible. 4. The light got completely soaked on the commute in this morning, and the lens still had mist on the inside of the lens 8 hours later for my ride home. I therefore doubt it is as waterproof as they believe. 5. The way you charge it seems pretty ropey. The charging cable attaches to the light using magnets, rather than slotting into the light. This might be seen as a good thing, but it’s really dodgy and falls out without much provocation. I didn’t have a single person react to the image in front of me during my commute today, because no-one could see it. They won’t see it in the future either, because I won’t be using it. It’s a shame, because the idea sounded good, but alas all the high spirited marketing from the light’s creator has not been matched by a quality product. A better mount, being able to direct the lights independently, actually waterproof and a significantly higher powered laser and/or larger bike image are needed, I reckon.